I got to the race early to get my bib and to get a parking spot. The race director's email warned us of the limited parking, so I thought it would better to get there early. I didn't have anyone to carpool with, sadly. Maybe next time I can convince a friend to run with me? When I checked in, the very kind people at the table asked me what size shirt I wanted. I asked if they were unisex and she said the best thing ever. "no, all Trail Monster Races get men and women sizes". I love her. After she gave me my shirt, I knew I had to earn the right to wear it. How awesome is this shirt? I think it is definitely the best race shirt I've ever gotten. One thing is for certain, I was rather impressed to see so many Altra shoes on the Lamey Wellehan table! Of course there were some other brands, but Altra is my fave. People started heading over to the starting line area, so I thought it would a great idea to do the same. Time to get my head in the race and to make sure my snowshoes were on correctly. And then I saw this guy. He's badass. It was overcast and barely 37 degrees. But I wasn't quite ready to take off my jacket! It was definitely a little chilly. I guess I was spoiled with 43F the day before and sun! I think it was about 37F at race start and it was overcast. Not bad at all. It definitely could have been worse! Eventually I took my jacket off and hung it on a branch. 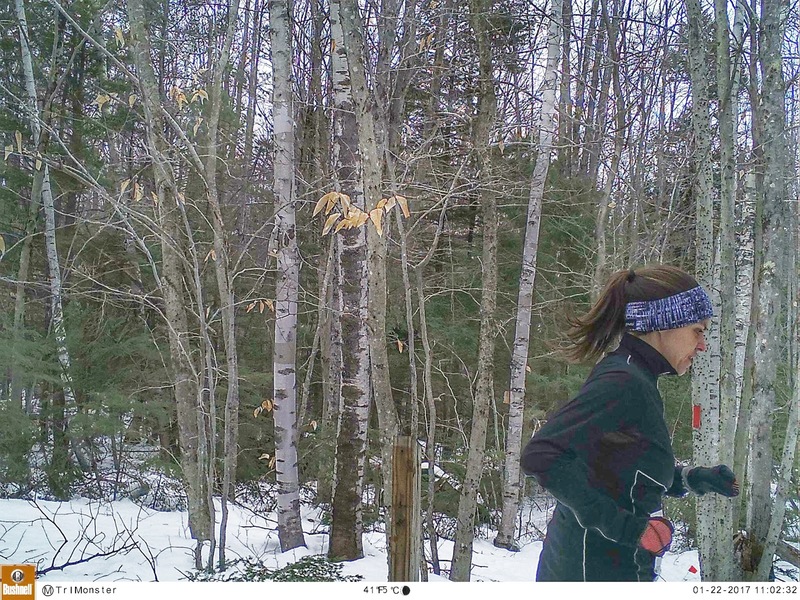 Still not sure about this running in snowshoes thing? And single track? Oh jeez! That part made me nervous. I set myself in the middle of the pack (ish) and waited for the race directors directions. I loved how laid back he was and everyone around me seemed quite chill. Shortly after his directions, we were off. I waited for a bit to start my Garmin because I was SOOO far back. My actually results are smidge longer since this definitely was not a chip timed race. I love smaller races! The trails were taken care of quite well! I was impressed with the work the race director and John had done the day before. I was appreciative for sure! I had NO idea there was a trail cam out there. Lucky for me, it caught me focused and working hard. See! Proof I did work hard for this one! I had passed several people (when I could, safely). I was only passed by 2 people. I would call that a win. I had NO idea what to expect for a finish time as I had never raced a snowshoe race before. The actual distance of the race was 3.5 miles; therefore my pace is off. But the time is correct (well, from the moment I started to the moment I crossed the finish line). The official results have me with 42 minutes and change. That Momentum Bracelet has become my go-to race bracelet. Make It Happen is the motto at KVC - a lovely group of runners I have recently joined and already love being part of. I came home from the race feeling absolutely pumped. I had a blast and before I even left the race, I registered for the next one on 2/12! The next race in the series is the 4 miler. Then there is a 5 miler in March. If I do the March one, it would be my first race in the 40 age group! Eek! Actually, after completing this race, it got me thinking that I want to run more trail races this year. Which means I will have to train on more trails. Gulp. That's the hard part because I am such a nervous nelly, I won't run on trails, in the woods, alone. That will take some planning to get a friend to run with me, but it's worth it! I'm eyeing up the Pineland's 25k right now. We'll see! When I came home, I didn't bother changing and I went out directly for more mileage! It was Izzy's 8th birthday, so I had to run 8 miles. Only makes sense! I'm almost dressed head-to-toe in Altra above. Altra half-zip (the bomb! ), Altra tights (with mesh behind the knee...love this), Altra gaiters, and Altra KingMT trail shoes. I HAD to have on something Spandits, because Spandits is my first love. So I chose the super awesome bandit. 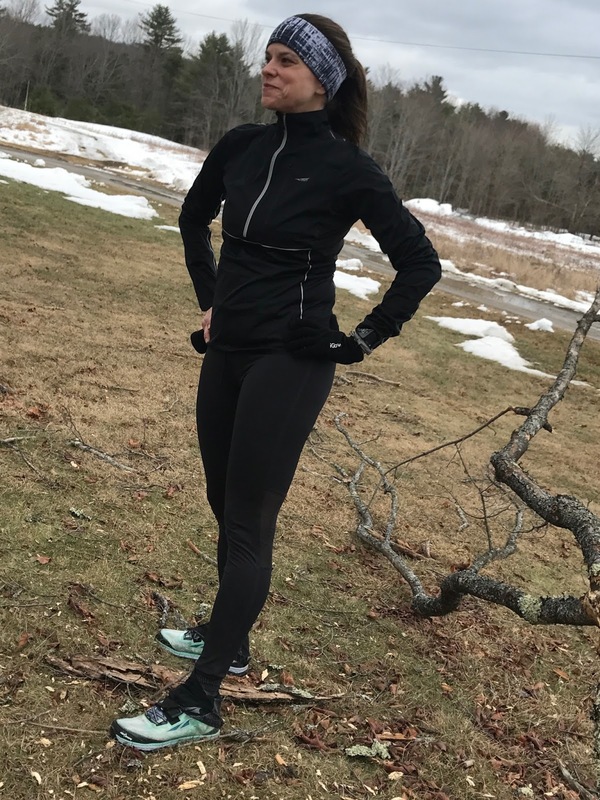 (20% off right now at Spandits! - tell them Jen B sent you too!). Yes, the best race shirt. I had to wear it after I showered. I cannot wait to see what the swag is at the next race! TMR, you rock! Oh, and I have some freaking AWESOME news! 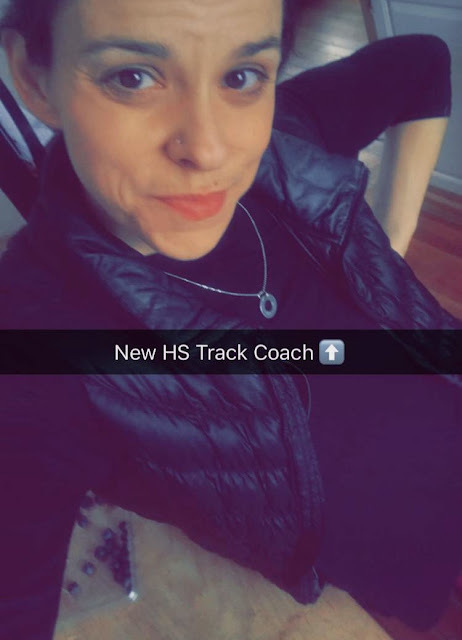 I'm going to the Head Track Coach at Gardiner HS this spring! To say I'm pumped would be a complete understatement.